Habitat: Brazil. 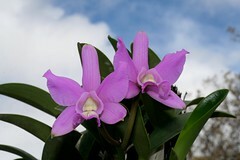 Cattleya walkeriana is found in the Brazilian states of Minas Gerais, Goias, Sao Paulo and Matto Grosso. Grows on trees or moist rocks near streams up to 2000 meters in elevation. Plant Size: Compact. The short, jointed pseudobulbs of Cattleya walkeriana are topped with one elliptical, leathery leaf. The flower does not form in a sheath at the top of the pseudobulb as in other Cattleyas but rather develops from a short stem from the base of the last pseudobulb. Flower Description: Fragrant. The flowers of Cattleya walkeriana are very flat, waxy, heavily textured and rose purple in color. Lip coloration is the same or slightly darker than the petal color. The flowers form at the base of the pseudobulb and bear one to three flowers. Additional Information: This species grows best well with bright light and good air circulation and can grow well in a pot or mounted on tree fern. Let the plant rest after flowering. Keep on the dry side as they tend to rot with too much water. There are additional color forms of this species available including an award-winning white clone Cattleya walkeriana alba 'Pendentive' AM/AOS. Cattleya walkeriana has been used as a parent by several breeders to produce compact "minicatts". Some hobbyists report that some plants can be shy bloomers. If this is the case for you, adjust the growing conditions until you find the spot where the plant is happy.